RULE 3, part two: Mulch like hell, or Leaf thieving. 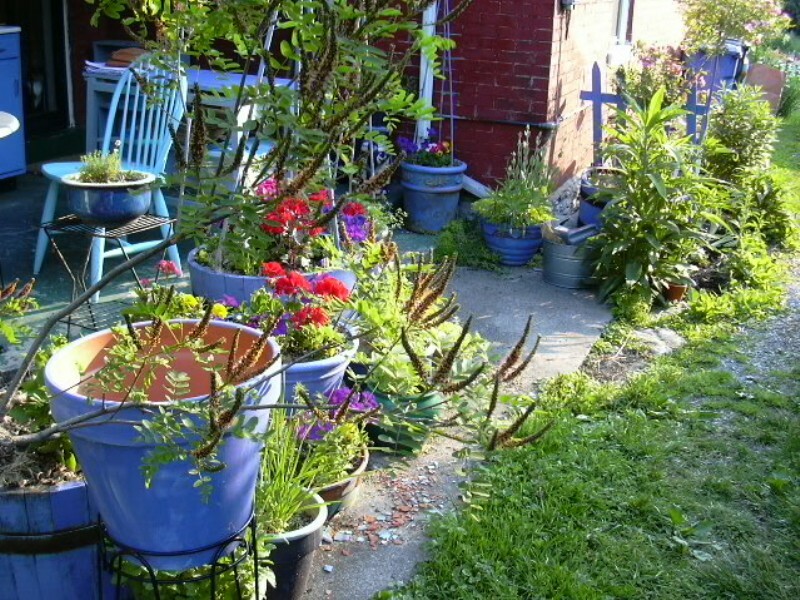 You might notice a lot of blue stuff in my garden. I think I first started using this band of blues when I bought the folding bistro table and chairs on the side porch. The chairs not only had molded plastic seats, but they were white — and UGLY. So I found a new primer that would paint plastic. [This was years ago. There are probably lots more options now]. Among the spray paint colors at the local hardware store was French Country Blue. French Country Blue turned out to be a magical, glowing violet-blue. It looks great with any flower. Greens really pop against it. No other color is such a catalyst to anything else it touches. [The runner-up is chartreuse, but I get that from foliage]. What could be better? Since I can’t leave well enough alone, I found out what could be better: blue-violet with an overlay of cobalt blue, as on this urn. [The raised details are daubed turquoise]. After years of coveting a cement urn to use as a hose guard, I got one and painted it with the can of exterior violet-blue I had from a year or so ago. But in my frenzy, I hadn’t stirred the pigment in it enough, so it seemed a little bland. I had the last dregs of the cobalt acrylic pigment I’d bought years ago at Michael’s just because it was so damned lovely. There was so little left in the jar I had to water it down a lot. So it dripped over the base coat just like a glaze running in the kiln. The glazelike quality echoed my new obsession with pottery and glazes. 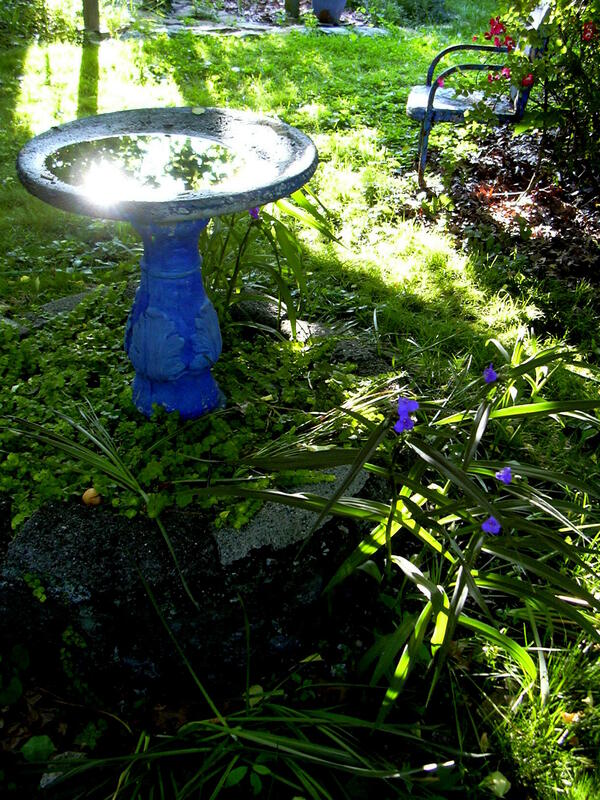 I had painted the birdbath the same colors years ago, but did not think to make the “glazes” run. 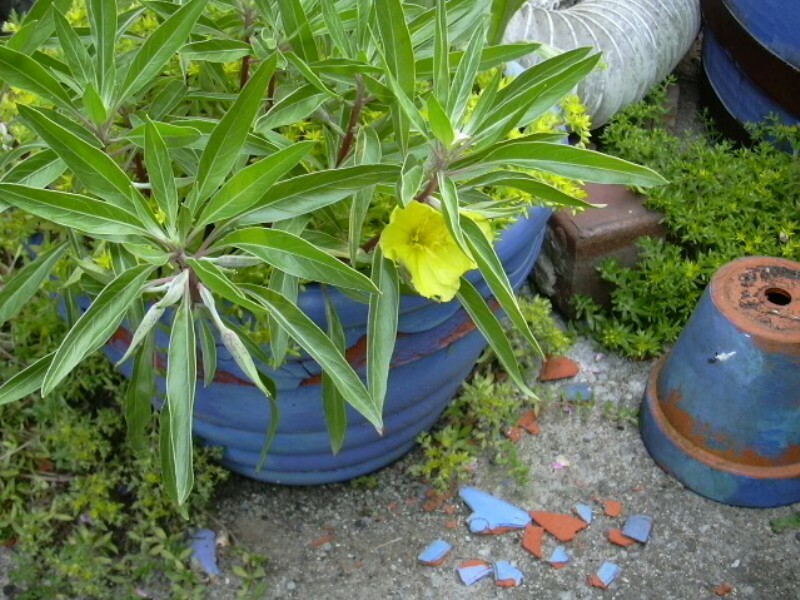 Here it is in the morning, with tradescantia (spiderworts) and a decrepit chair. I got all wild and started painting everything blue. Pots, chairs, trellises, bamboo plant stakes. . . . There are very few sure things in this life. But I guarantee you cannot go wrong with painting anything in your garden this color. Maybe I was a Pict in a previous life. Then, I discovered Jacques Majorelle. Majorelle’s story is great. He was a painter, also the son of a famous painter, who had terrible health problems and moved to Marrakech, Marocco, in an effort basically not to die. He created this garden in Marrakech. He discovered the power of violet-blue. He lived and gardened and painted in this place until he died at the age of 76. Another one of my artist-heroes who did what I’m aiming to do: garden and do my art for a long, long, long time, till I drop dead. Preferably in the middle of a project. For more on Majorelle, check out Majorelle: A Moroccan Oasis by Claire de Virieu [photos], Pierre Berge [text] and Madison Cox [text] (Vendome Press 1999). 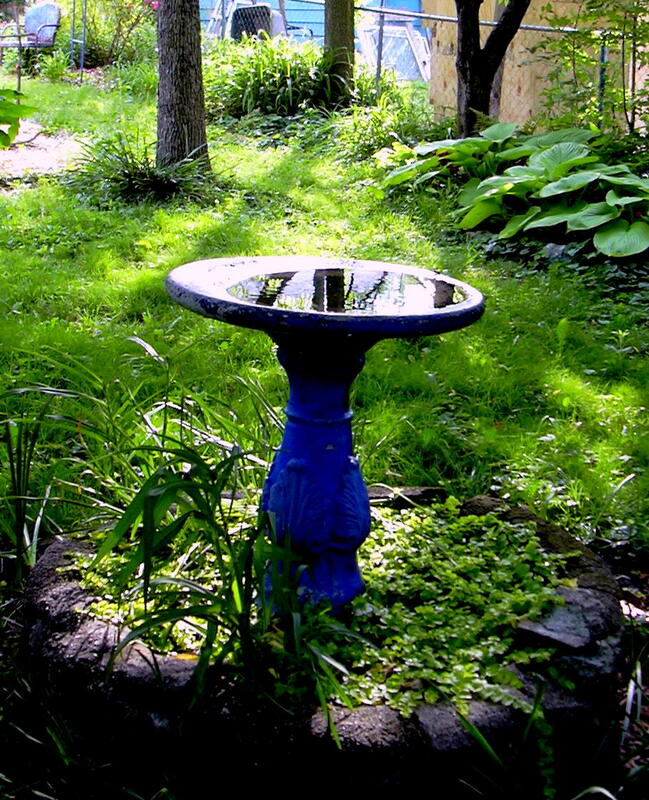 The nicest online photos of the garden are at Jan Johnsen’s blog, Serenity in the Garden. The world owes a debt of thanks to Yves St. Laurent and Pierre Berge, his consort, who bought and restored this garden and opened it to the world. To tour it, see its link, JardinMajorelle.com. Aside | This entry was posted in seasonal updates & random musings, tangentially related info and tagged art, exterior spaces, garden design, garden how-tos, Home, photos, structure. Bookmark the permalink. 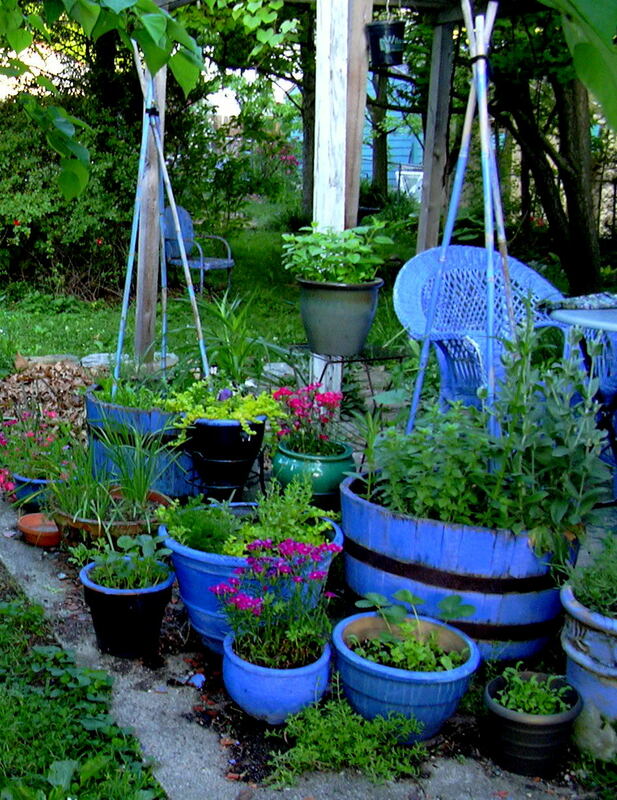 Ahhh, the beautiful blue…there’s just no other color than this to make a garden a haven. Karah and Bob…and kitties…absolutely stunning. Thank you, 2E! Just tonight I was bragging on your backyard to Cassandra: the ferns, the hostas, the koi pond, the genius floating deck. THANKS! Count me among your fans.